I've never really been a massive lover of eating salad on its own; limp lettuce and soggy cucumber taste just as boring as they sound. But as I'm trying to expand my cooking repertoire and eat more healthily after Christmas, I decided to search for some more interesting salad recipes to try out. 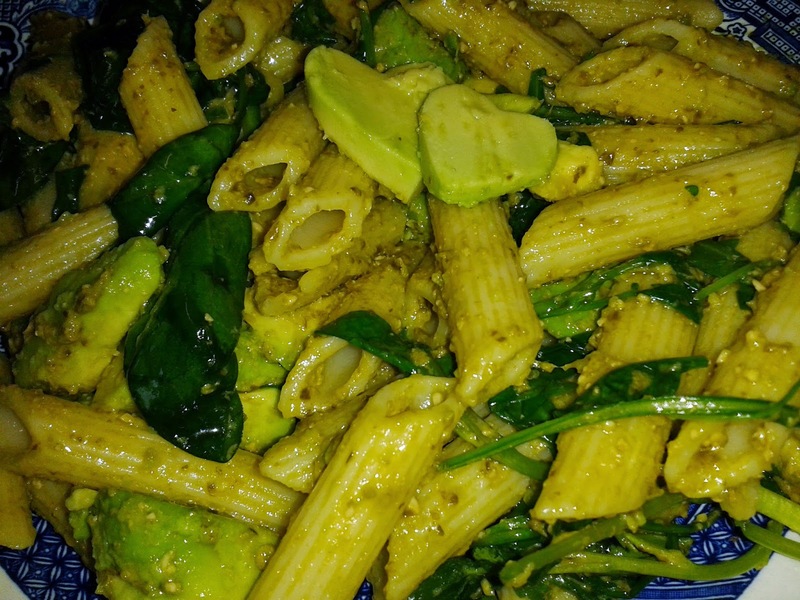 I like to make things that are quick and easy yet tasty and nutritious, so after browsing other recipes for inspiration, I came up with an avocado and pesto pasta salad. Pesto pasta is one of my staple dishes as it is so easy to make and is great to throw together when you can't be bothered to cook. I usually make it with roasted or stir-fried veggies but I never thought of having it with salad before. 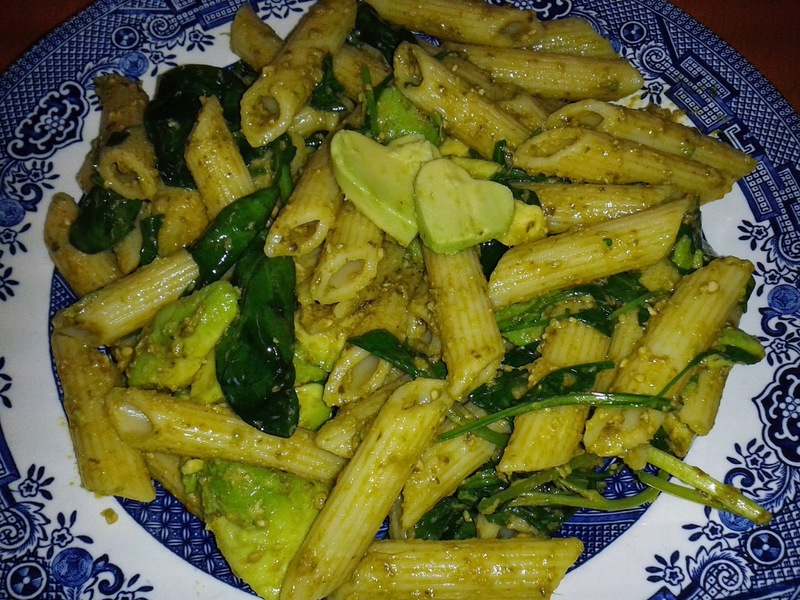 All you need to make this simple dish is some pasta, some vegan pesto, a ripe avocado and a bag of ready-washed salad such as Florette Salad. I made this for lunch, but if you wanted it for dinner (or just want a bigger serving!) then just increase the quantities as you wish. Ingredients (serves 2): ♥ 150g dried pasta ♥ 2-3 handfuls salad leaves, such as spinach and rocket ♥ 1-2 tablespoons green pesto ♥ 1 avocado, cut into chunks Method 1. Cook pasta according to instructions on packet. 2. Drain the pasta, return to the saucepan then wilt the salad leaves by mixing them into the warm pasta. 3. Add the pesto to the pasta and salad leaves and mix well to coat. 4. Stir in the avocado pieces and serve warm or cold. I am really pleased with how this recipe turned out and I will definitely be making it again. It was really creamy and full of flavour. I can't wait to start experimenting with other ways to use salad - let me know if you have any good vegan recipes! I love reading other bloggers' wishlist posts so I thought I'd start doing some of my own! I'm going to split my wishlists into beauty, fashion and homeware. I thought I'd start with a little homeware wishlist as I've seen some lovely things around. 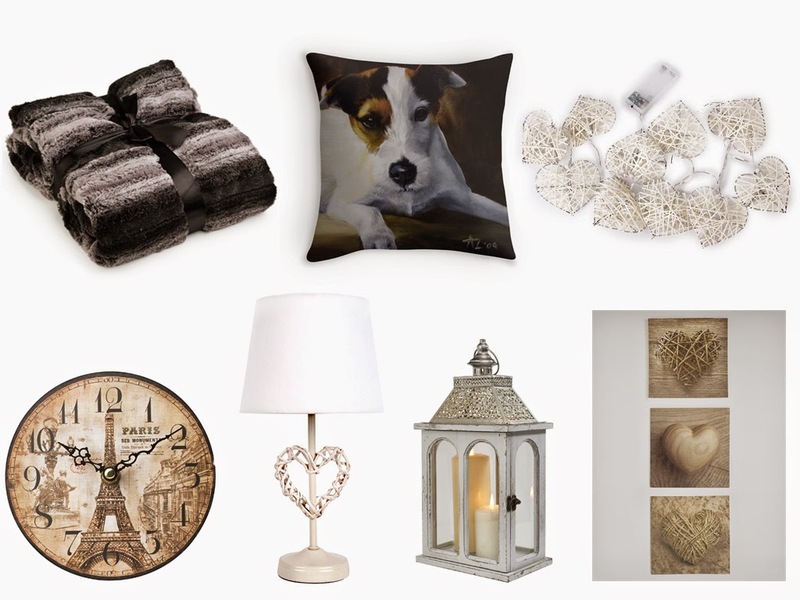 Faux Fur Throw | Jack Russell Cushion | Fairy Lights | Paris Clock | Table Lamp | Lantern | Heart Canvases I especially love the Jack Russell cushion!